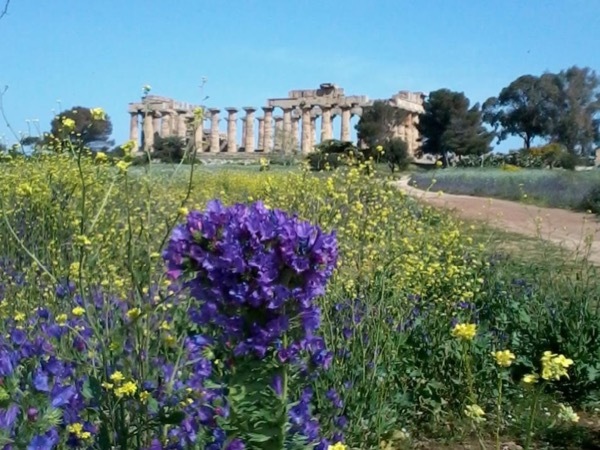 Benvenuti in West-Sicily! My name is Regina. I am German, married for over 25 years with a Sicilian, a former high-school teacher. We live in the countryside near my husband's home town of Alcamo, together with our cats, dogs, goats, sheep, chicken. For us the most important are our fast growing children: Elia (22) and Francesca (21) are both living and studying in Germany, only Elena (17) is still taking care of her parents! I'm working as a tour guide in the province of Trapani. It will be my pleasure to show you the beauty and hidden secrets of Western Sicily's most important archaeological areas: Segesta and Selinunte. 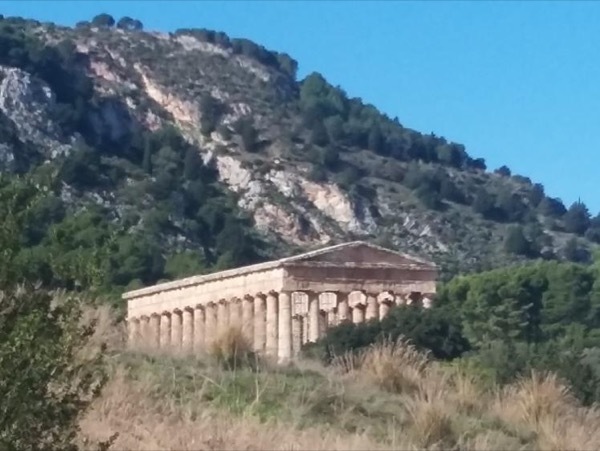 Segesta is not far away from Alcamo, where I'm living, I call the temple of Segesta "my favourite, and also my private temple. . . ". It's one of the best conserved temples of the Greek Doric classic architecture. Built in the late 5th century b. C. , never finished, the temple is standing . . . "in the center of a turbulent landscape like a stormy sea" . This is the description Vincent Scully gave about Segesta in his book "The Earth, the Temple and the Gods". And I would like to give you the time not only to understand this building, but also to feel the sensation of being in a special place! 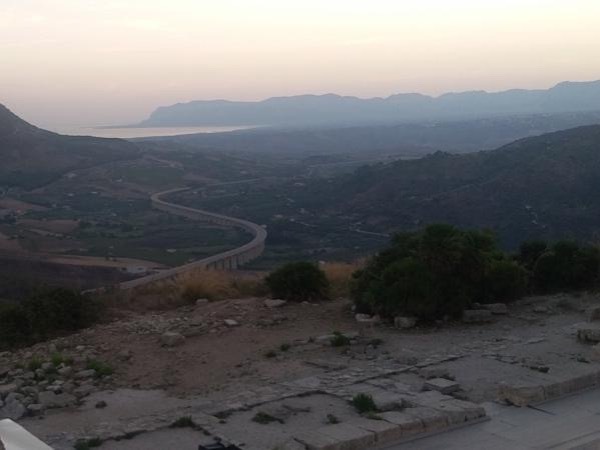 Of course we will also visit the Greek Roman theatre on the top of the hillside, where once the city of Segesta was and enjoy the incredible view in direction of the Gulf of Castellammare, the former port of ancient Segesta. We will "walk through history", I will talk about the very first beginning of the Elymian settlement in the Middle Bronze Era, I will show you the excavations and rebuilding done in the last years by the scholars, dating back to the Classic and Roman period and we will see the ruins of a mosque, a Norman castle and a church done in the Middle Age. The other walking tour that I would like to do with you, is inside the archaeological park of Selinunte. Selinunte is on the south coast of Sicily, the most Western colony the Greeks found on our island. And today it is the largest archaeological area all over Europe! But don't worry; we have not to visit all 660 acres! I prefer to share with you the emotions that nature and architecture of Selinunte inspires in everyone! We will stand in front of temple E on the eastern hill side, trying to imagine that 2500 years ago on the same place the Greeks hold the worshiping in honour of goddess Era. We will enter inside the temple, talk about the rebuilding done in 1953 and do the difference between original and copy. Than we will sit on the the huge capital belonging to the columns of temple G and think of the hard work of the slaves in erecting these buildings. We will talk about the terrific earthquake that in late ancient time destroyed the city of Selinunte, stand in front of the excavated city wall, walk up to the Acropolis and learn how to date a temple in counting the drum pieces of the column of temple C.
And as a last thing we will go to the Polis, standing on the main street, discovering that the ancient roads of Selinunte had been done with the same checkerboard system as the roads of Manhattan! For each of my walking tours meeting point is the entrance of the archaeological area, we need about three hours to do the tour, the walking part is not strenuous and easy to do. If you are a family with children, I will do the tour in a manner that the kids will be part of the history and will have fun! Hopefully we always will have a good and fun time together. I am looking forward to welcome you in West-Sicily! Regina was absolutely fantastic. One of the most knowledgeable and personable guides we have ever had. Her ability to explain the history behind Selinunte and the surrounding areas made the ruins come alive. Highly recommend her and this tour. From 1983 until 1986 I studied art history and communication science at the University of Munich/Germany and Milan/Italy. After continuing my studies at the university of Palermo, in 1991 I received my MA in foreign languages, Italian, German and English. For seven years, beginning in 1987, I was working as a tour director with German language groups in Southern Italy, Sicily and Malta. In 1997 I received my license as an archaeological tour guide for the province of Trapani in West Sicily, since than I've been guiding individuals and groups from all over the world in English, German and Italian languages. Also during the winter month I teach German language courses for different High schools in West-Sicily.